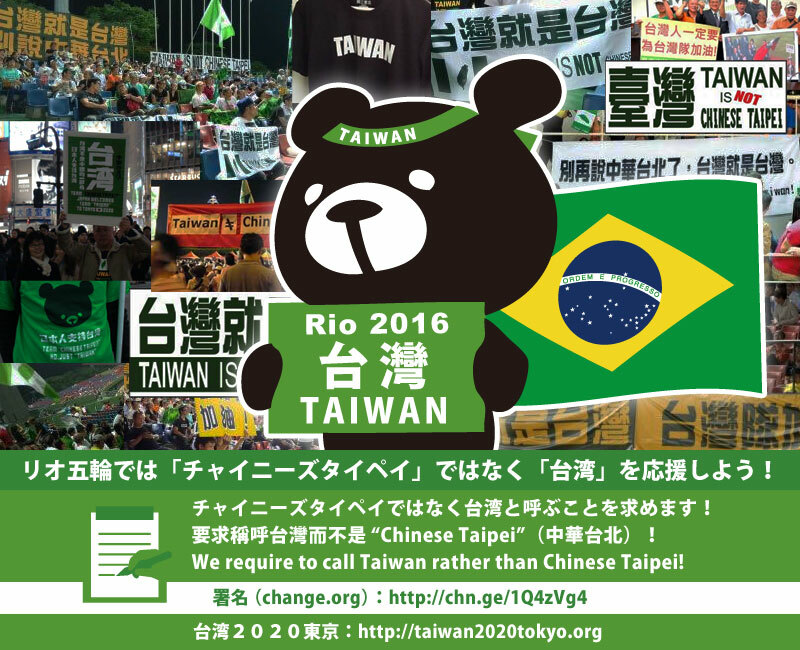 We will develop a campaign to cheer for “Taiwan” in Rio Olympics! We will run the campaign to cheer for “Taiwan Rather Than Chinese Taipei” in Rio de Janeiro Olympics to be held in Brazil from August 5, 2016 to August 21, 2016 as well as in Rio de Janeiro Paralympics from September 7, 2016 to September 18, 2016. 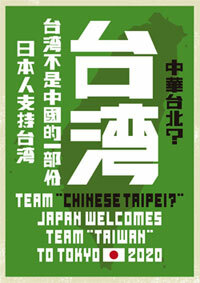 We would like you to promote the campaign to ­­­cheer for “Taiwan Rather Than Chinese Taipei” with boards for cheering, T-shirts and other goods indicating the words of “TAIWAN” and/or “台湾” on them. This is a movement to secure our freedom to cheer. You are welcome to freely promote “Taiwan” in your own manner, and there is no problem if such goods are handmade ones. Those who are going to visit venues in Rio are requested to demonstrate such goods in front of TV cameras and journalists gathering information. Also, those who will watch a live telecast are encouraged to make an online appeal about their supporting “Taiwan” in respective countries. People from various counties have made comments on a signature-collecting campaign for “Taiwan Rather Than Chinese Taipei”. It is expected that people around the world will find the word of “Taiwan” and/or “台湾” in your goods while enjoying the Olympic Games and that many of them will feel sympathy for the campaign, leading to the increasing number of people cheering for “Taiwan”. This campaign never intends to disturb the holding of the Olympics nor to “Bring Politics into Sports”. It is Beijing that has been applying pressure by bringing the politics into Olympics. Actually, the name referred to as “Chinese Taipei” has been utilized for political purposes. As every one of us has his/her own name, the country name is essential for the people of that country. Taiwan is not a part of China. Taiwan is supposed to be represented as Taiwan. Lastly, this campaign of “Taiwan Rather Than Chinese Taipei” is the one that was launched by volunteers of Taiwanese and Japanese, which campaign sets 2020 Tokyo Olympic Games to be held four years later as a benchmark. Triggered by this initiative, a variety of individuals and groups making an appeal for “Taiwan” have been appearing on the scene and ordinary citizens taking actions in their own ways. We will reach out to cultural figures, journalists and even politicians to encourage them to be interested in this campaign. We would like you to read the comments made on the signature-collecting site (change.org) and know about a number of thoughts.